Cookies make a great treat at any time and for any occasion. There are dozens of varieties and they are easy to make and store. Chocolate chip cookies are the most common, but don't let that stop you from trying different cookie recipes. You might find another favorite. You'll find recipes for many types of cookies in this section such as chocolate orange cookies, homemade oreos, and oatmeal cookies. There are also tips about making cookie dough, using cookie cutters, and how to cool and store your cookies. 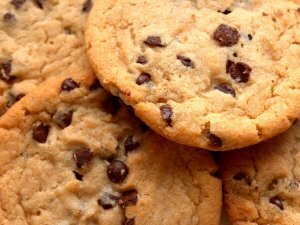 The following articles are available for the 'Cookies' topic. Click the article''s title (shown in bold) to see the associated article. Brownies are delicious and cookies are delicious, so why not combine them? Here is a great recipe that will give you cookies that you will definitely make more than twice. Chocolate chip cookies make a delicious treat and are fairly easy to make. But what can you do when they come out hard instead of soft and chewy? If you love the tastes of orange and chocolate, and simply adore the way that they can go hand in hand, then you need to try some chocolate orange cookies. Here is a simple, though exquisite, recipe for making some chocolate orange cookies yourself. Spice cake is great and coffee cake is wonderful, but what if you could somehow combine the two of them? Well now you can with this mouth watering recipe for some coffee spice cookies. Once you have these, you will simply have to have them again and again. Want a great dessert treat that's appropriate for any occasion? Try a cookie dough log for a change of pace. Now that you've made some amazing cookies, you need to keep them fresh. Find out what you need to do after they come out of the oven. Let's face it, chocolate chip cookies are perhaps one of the most popular types of cookies in existence. This also means that if regular chocolate chip cookies are good, then double chocolate chip cookies are great! Learn how you can make your own fantastic double chocolate chip cookies with the help of this great recipe. Who doesn't love snickerdoodle cookies? These cookies have long been a favorite in households around the country, and even the world. They aren't all that difficult to make, at least as long as you follow this easy snickerdoodles recipe. Sugar cookies are some of the most classic types of cookies, and you need a great recipe. Here is a recipe with a secret ingredient that will result in everyone begging for more. Whether it is during the holidays, or you are simply in the mood, gingerbread cookies are a wonderful treat. What is even better is if you have made them yourself. Making great gingerbread cookies doesn't need to be all that difficult, and can actually be a lot of fun—particularly if you utilize this great recipe. Oreos are one of the best cookies that you can buy in stores. Now there's a recipe so you can make them yourself—homemade is always better! Shortbread cookies have got to be one of the most treasured holiday favorites. Unfortunately, it can often difficult to find any of these fantastic cookies in the store when it is not holiday time. Instead of going without for several months, why not use this fantastic recipe to make some of your own? How can you make sure your cookies stay soft from step one? Or get perfect circles from your cookie dough every time? A few simple tips ought to do it. These cookies are the best cookies ever made. They are a perfect blend of chocolate chip and oatmeal cookies. Whether it's due to the rising temperatures of spring and summer or you don't like how hot it can get when you bake, there are times when you want cookies without having to work. But how can you make cookies without baking? Here is a fantastic recipe for some great no-bake chocolate cookies that you and your family will love. Kids love cookies. No-bake cookies are fast and easy, requiring little time to prepare and clean up. Want a cookie that really shows off without much effort? This delightful cookie is a very light cookie that has a great taste and looks like a lot of effort went into baking it. Cookies are always a hit, and it seems like oatmeal cookies are always in favor. Here is an outstanding recipe for quick and easy oatmeal cookies. In less than 30 minutes your family will soon be begging for more. If you're looking for a variation on a traditional sugar cookie, snicker doodles may be a great choice for a holiday cookie exchange. This cookie has been a holiday favorite at my house for as long as I can remember. Wanting a great-tasting cookie that will have your family and friends asking for more? This is a great sour cream sugar cookie that is simple to make and will become a family favorite. How thick should you roll out dough when you're cutting out cookies? What can you do to keep your gingerbread people's arms in place? It's easier than you think. FREE SERVICE: Receive an e-mail several times each week with a featured cooking tip. Enter your address and click "Subscribe."